Caring for all of Maine. Golfer or not, this will be a fun event with golf paid for and access to tasty food and craft beers! 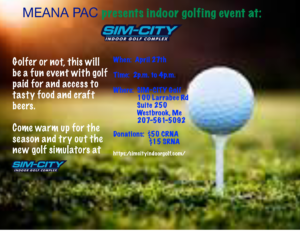 Join us on April 27 from 2-4pm at SIM-CITY Golf in Westbrook. Plus, it’s a great way to warm up for the golfing season and to try out the new golf simulators at SIM-CITY. Donation is $50 for CRNAs and $15 for SRNAs. 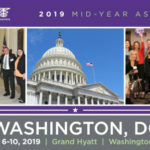 Networking, education and industry updates! 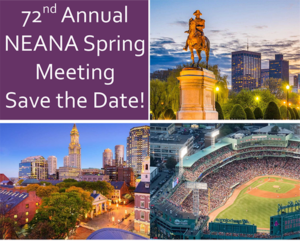 Join us for the NEANA 72nd Annual Meeting on April 12-14, 2019 at the Burlington Marriott in Burlington, MA! This event will feature industry updates, trending course topics, and a great opportunity for you to network with your peers. Classes will be approved for 20 Class A credits from the American Association of Nurse Anesthetists (AANA), including pharmacology. PLEASE NOTE: The Boston Burlington Marriott is offering a special rate to meeting attendees (see below). 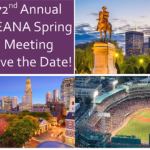 We look forward to seeing you at the 2019 NEANA Spring Meeting! 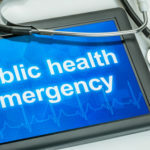 The Maine Association of Nurse Anesthetists works to protect and defend the practice of Nurse Anesthetists while advocating for patient safety and access to high quality, with evidence-based practice in collaboration with other medical agencies. Our vision is to be leaders in Anesthesia patient safety, while maintaining the highest quality of anesthesia care, including the care of our future needs of our profession, membership and our clients.